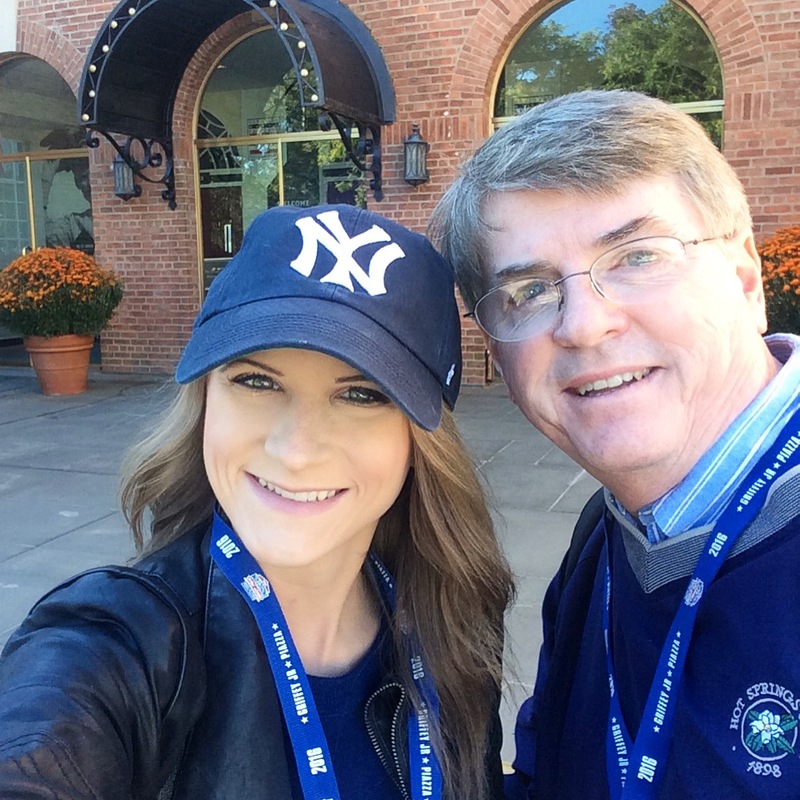 A couple of weeks ago, my dad and I made the baseball fanatic’s pilgrimage to Cooperstown, New York to attend the National Baseball Hall of Fame’s Film Festival. A documentary my dad was heavily involved in contributing to, The First Boys of Spring, was set to be the Saturday night feature film so my dad and I took this as a sign we needed a daddy-daughter trip. Narrated by famous Arkansan Billy Bob Thornton, The First Boys of Spring tells the history of how major league baseball spring training began in my hometown of Hot Springs, Arkansas. 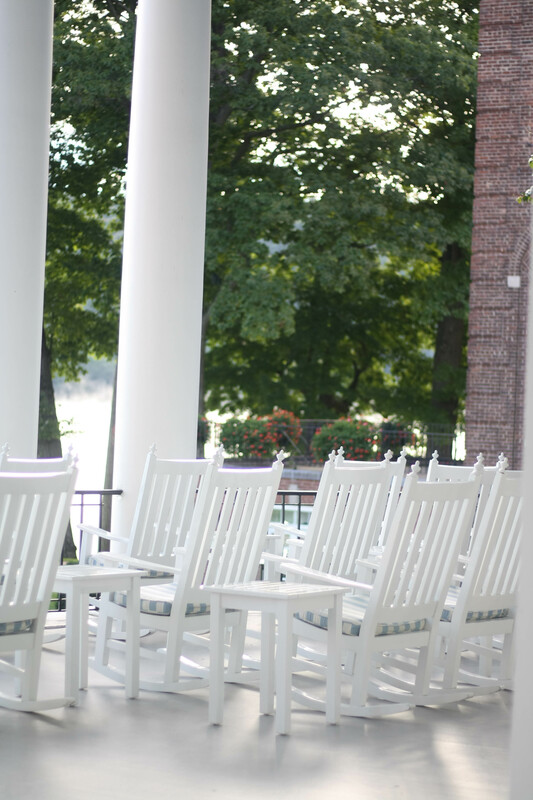 The documentary premiered at the International Hot Springs Documentary Film Festival in 2015 to wild popularity and has since been shown on PBS, the Major League Baseball Network, and Fox Sports. 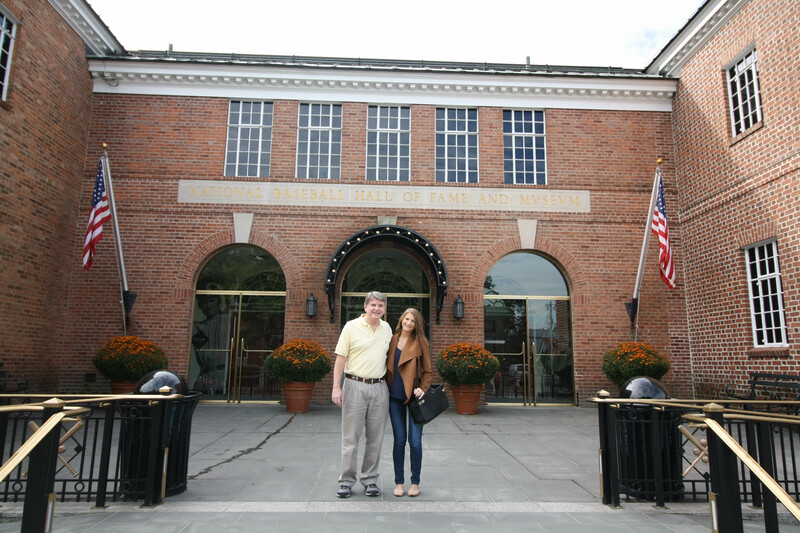 Dad hadn’t been to the Baseball Hall of Fame since the 1980’s and was anxious to go back and take me with him to experience not only the rich history of the Hall, but the beautiful simplicity of the town of Cooperstown. 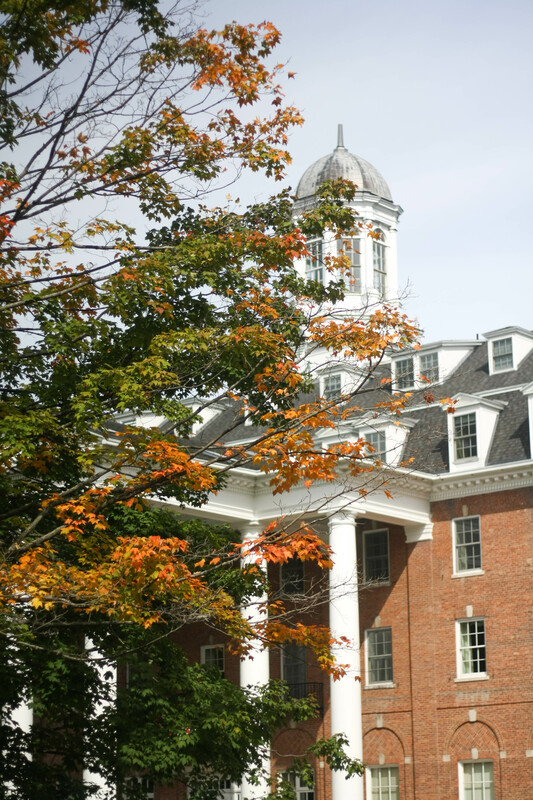 See our stunning luxury hotel, the delicious restaurants, the incredible historical artifacts, and the fun places we went on our vacation to Cooperstown, New York below! 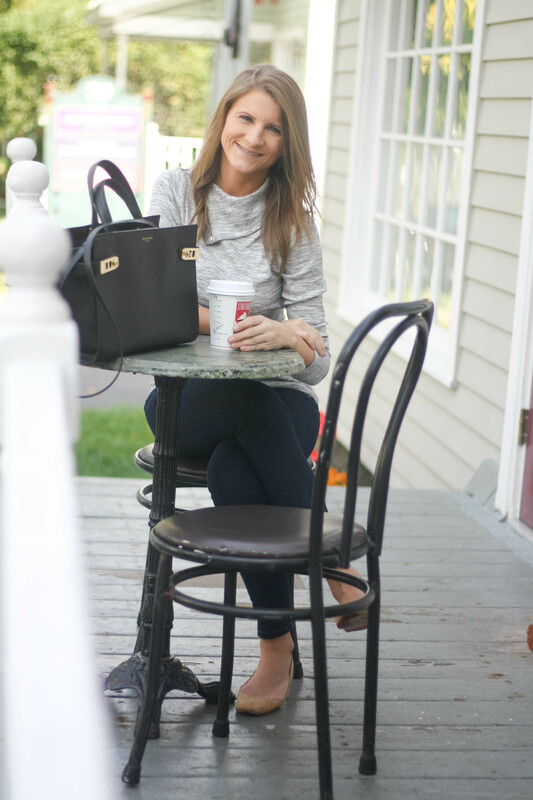 Keep your eye out for an outfit of the day post to see how I dressed for comfort and style while in Cooperstown later this week! 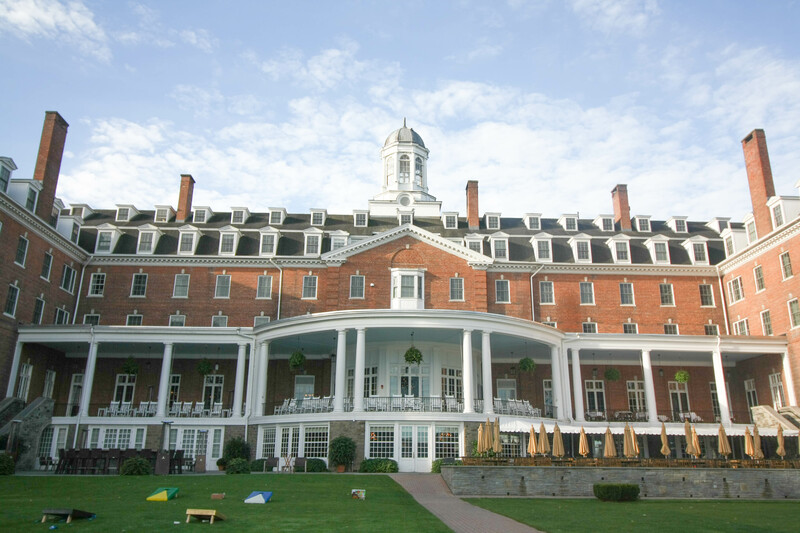 The Otesaga Hotel is a beautiful luxury resort set only a few blocks from the Main Street of Cooperstown. 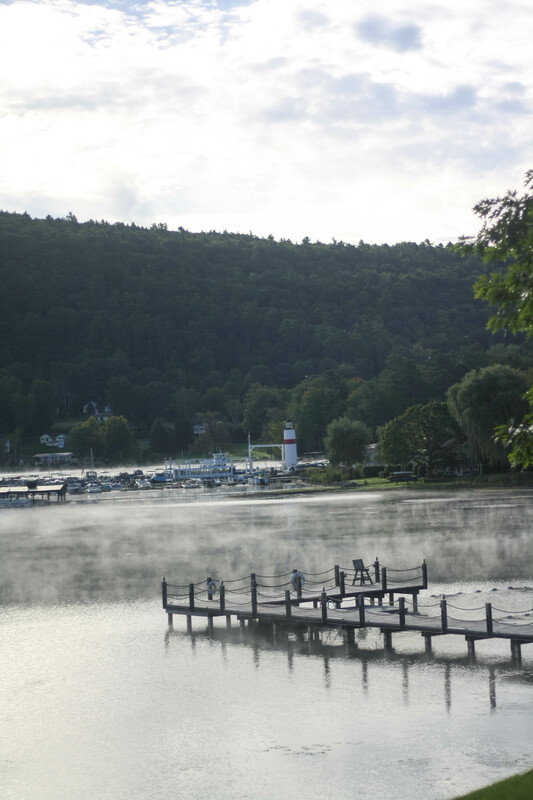 The back of the majestic hotel overlooks Otsego Lake for a picturesque view from our room (and bathroom!). 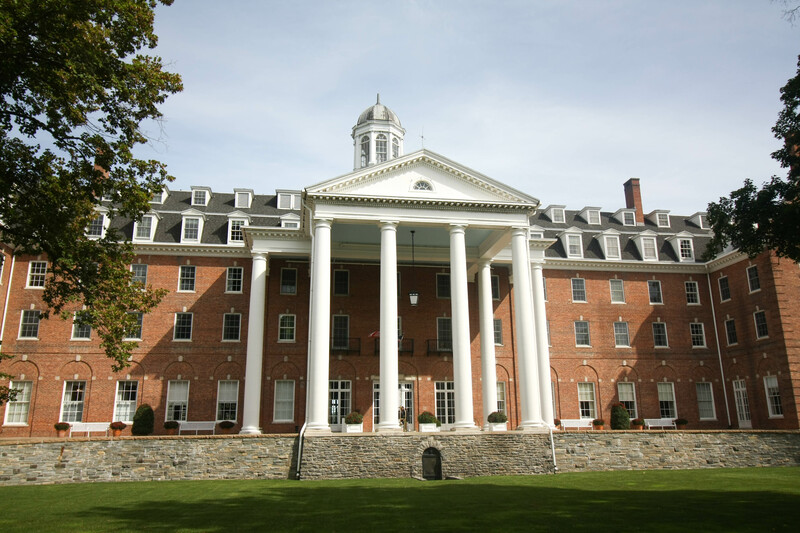 The Otesaga has several claims to fame, including being a favorite of the legendary James Fenimore Cooper (author of The Last of the Mohicans and namesake of the town of Cooperstown), and having its own episode on Ghost Hunters. 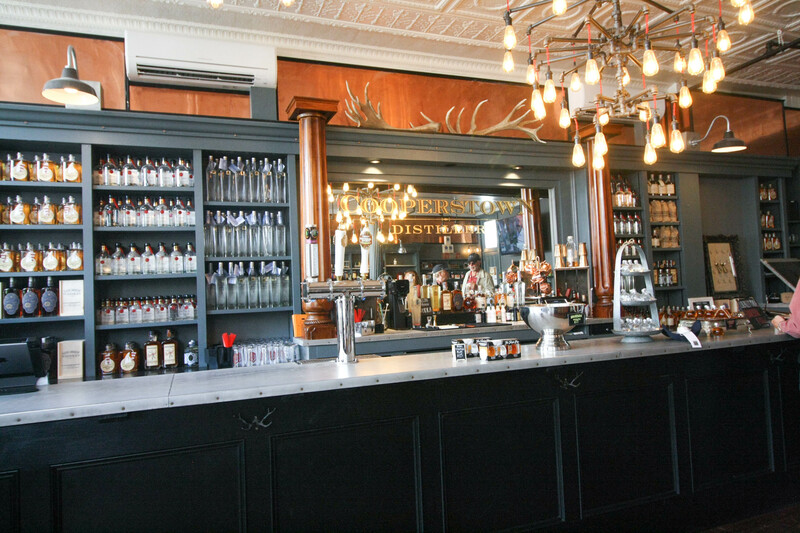 You read that right: the hotel is allegedly haunted. 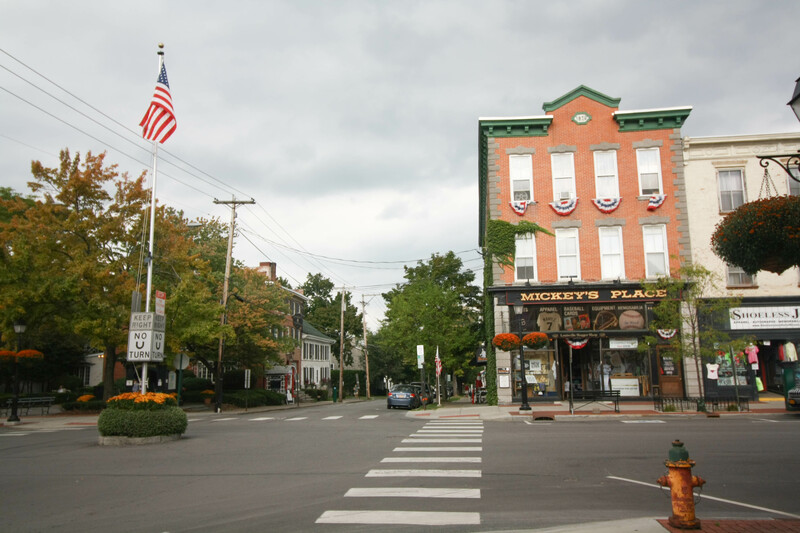 The town of Cooperstown is extremely small. 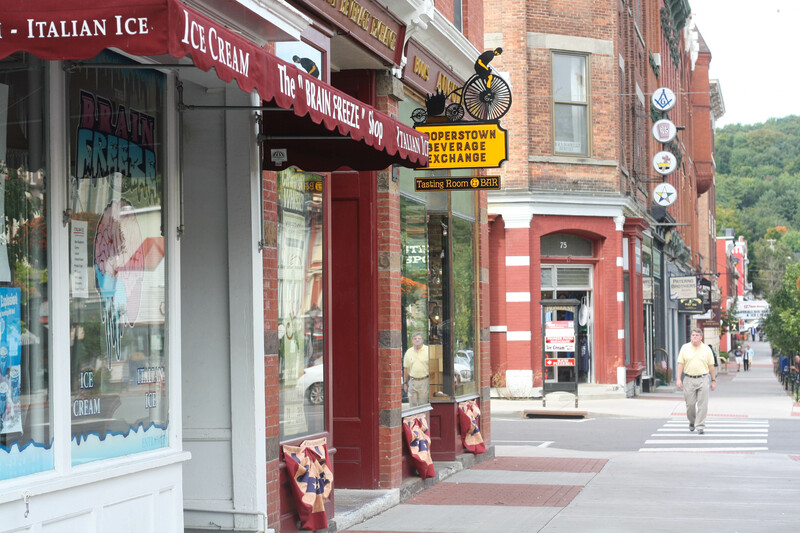 Main Street only spans a few blocks, but those few blocks are jam-packed with souvenir shops, ice cream parlors, and quaint cafes. Now, to the reason for the trip. 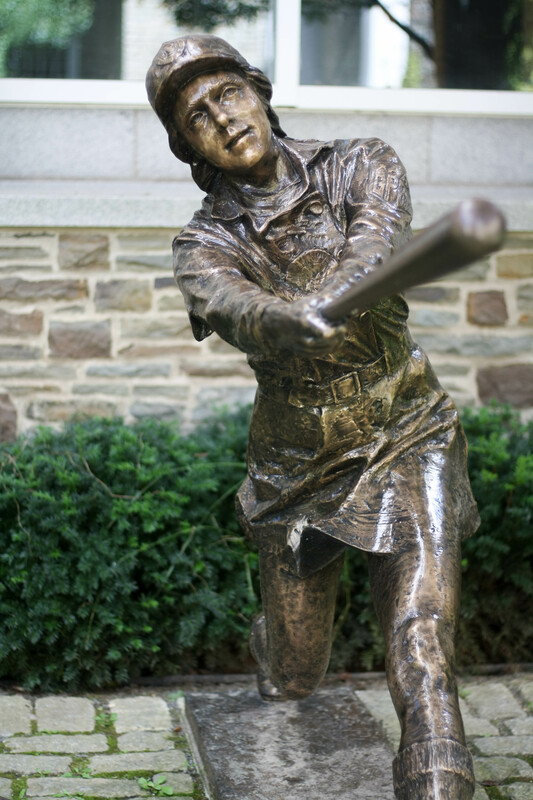 The Hall of Fame has Mr. Abner Doubleday to thank for finding its home in Cooperstown, New York, of all places. 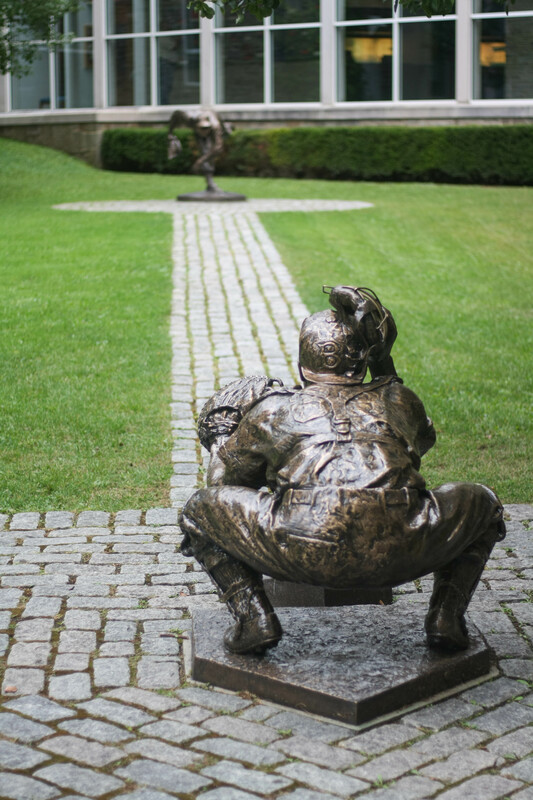 In 1839, Mr. Doubleday claimed that baseball was a true American game that was not influenced by any other sport, such as the English games of cricket and rounders. This is a complete myth because the game was, indeed, derived from other sports from other countries. Sorry, Abner. But the myth encouraged patriotism in the United States at a time that it was greatly needed, so it stuck. 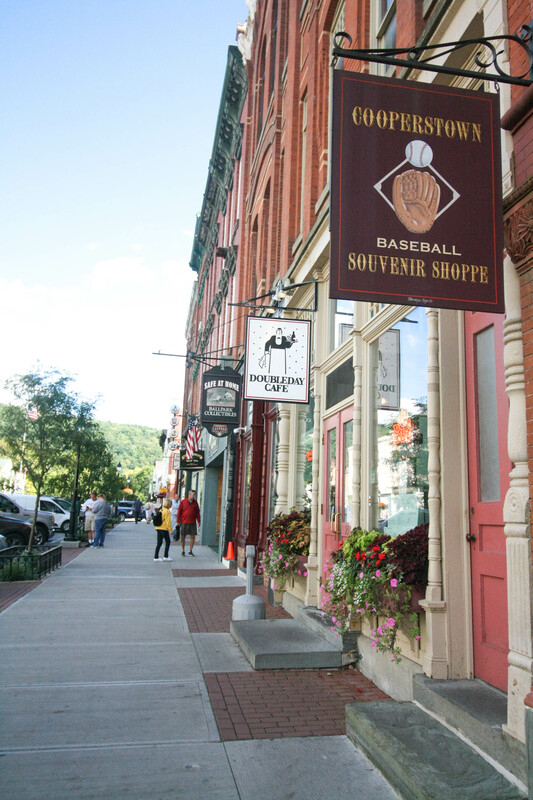 Cooperstown was the chosen site of the Hall of Fame thanks to the finding of what is known as the oldest baseball in existence in Fly Creek, just a few miles down the road from Cooperstown. 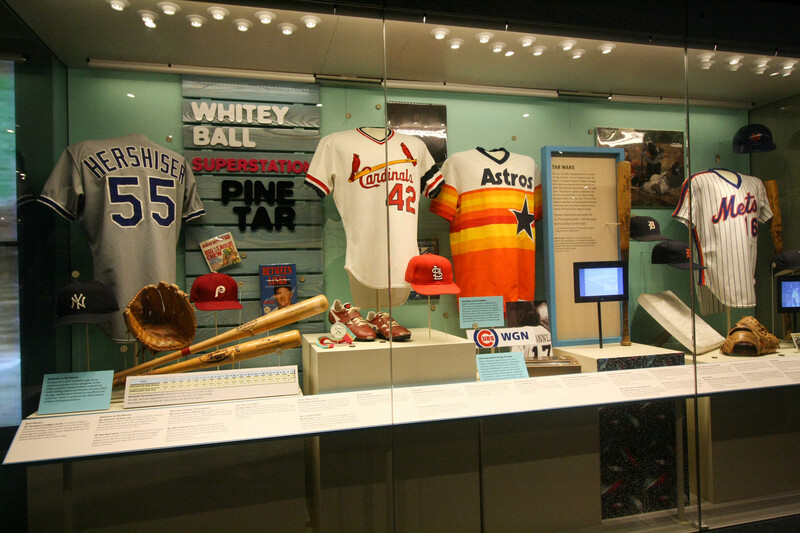 In the Hall, you will find tributes to the game’s greatest players. 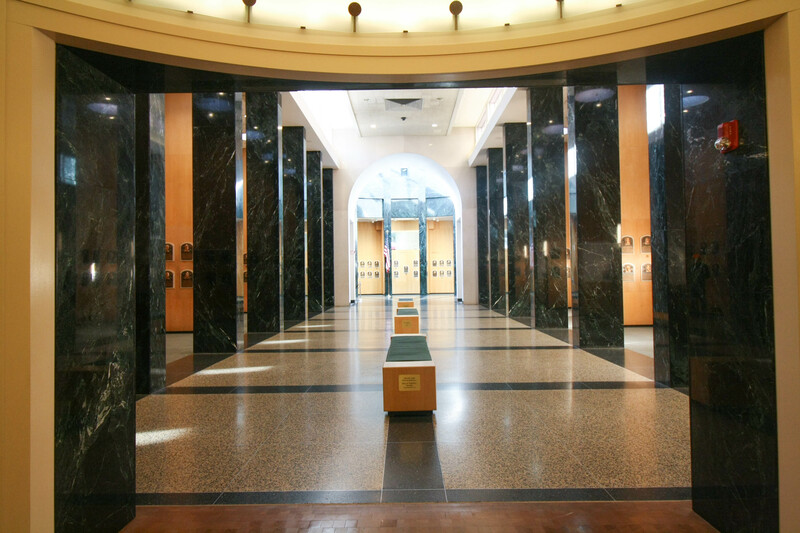 Babe Ruth, Honus Wagner, Hank Aaron, Jackie Robinson, Cy Young, Lou Gehrig, my dad’s childhood hero Mickey Mantle, and dozens of others are memorialized in this building. As a Baseball Hall of Fame tradition, this scoreboard is updated daily with the latest game stats. 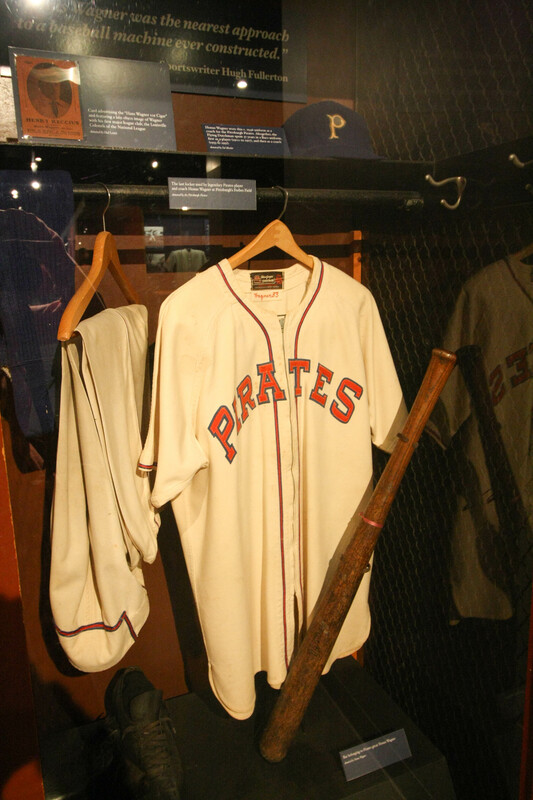 Honus Wagner’s uniform and bat. 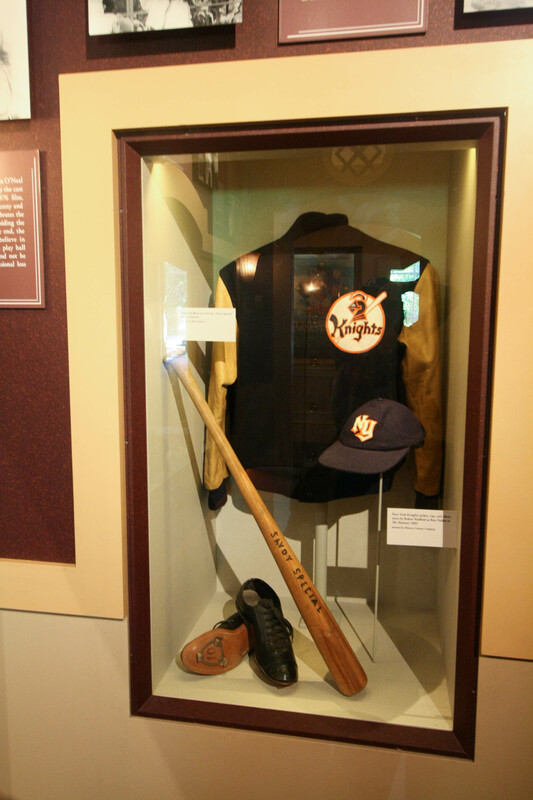 Props from The Natural, one of the greatest baseball movies ever made. The Honus Wagner T206 baseball card. 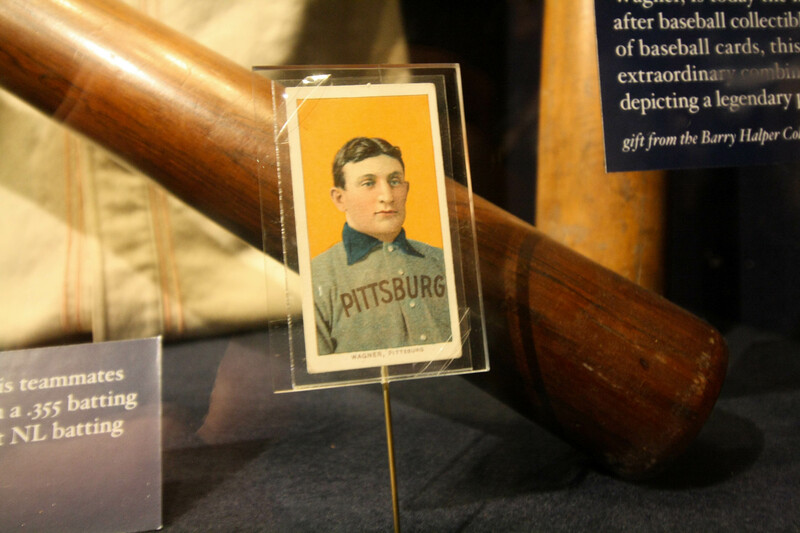 In 2013, one of the few Honus Wagner T206’s in existence sold at auction for $2.1 million. 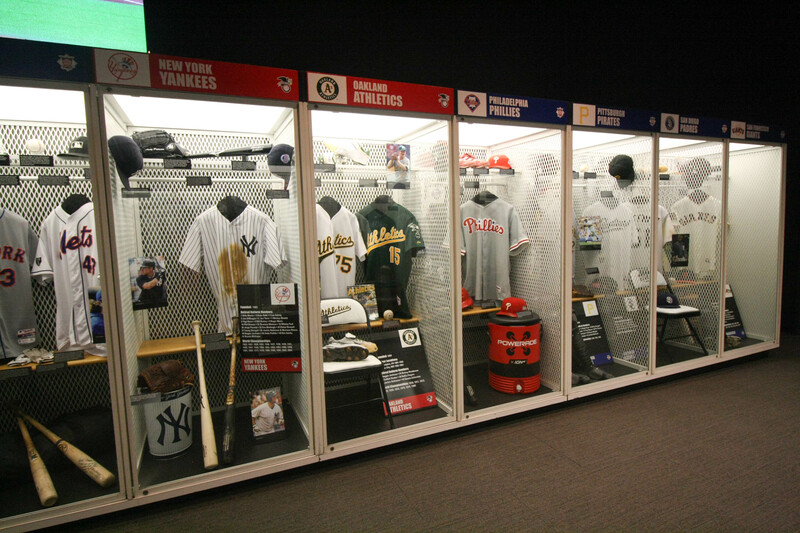 We were given a special look at a few items that are not currently on display in the Hall. 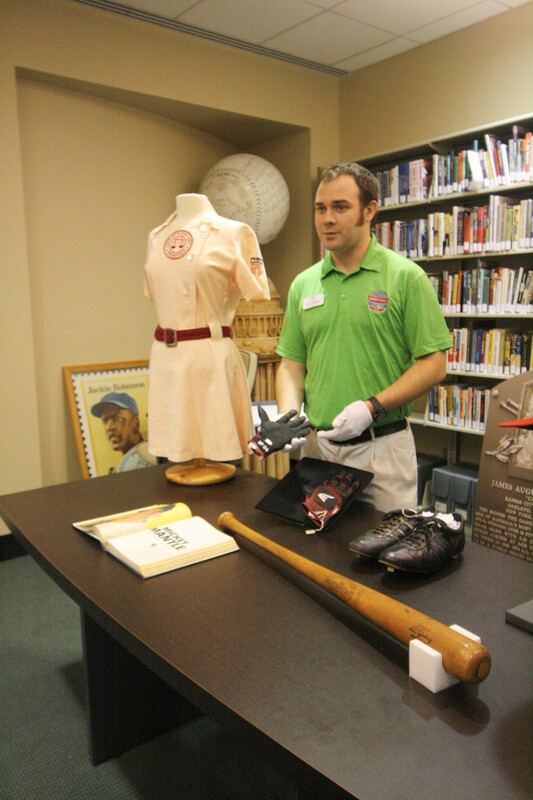 On the table is Lou Gehrig’s bat, a costume uniform from the movie A League of Their Own, and David Ortiz’s gloves. And finally, the Hall of Honor. 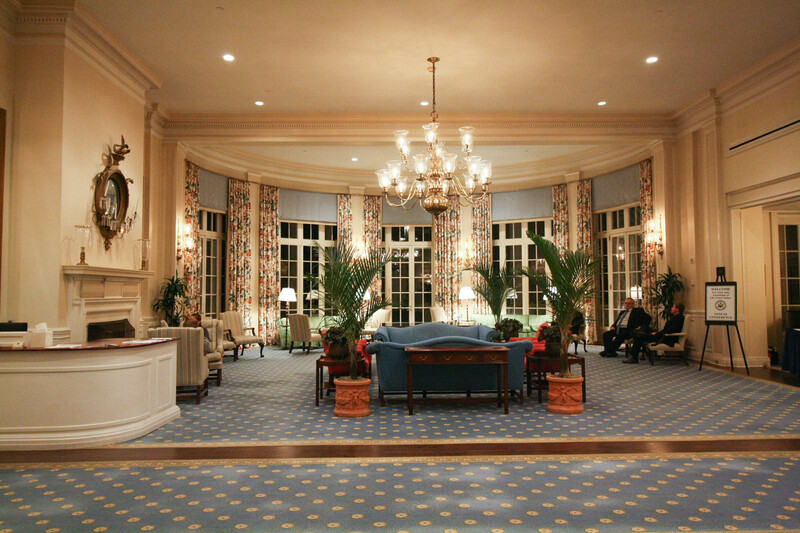 There is nothing more breathtaking than standing in this room alone. 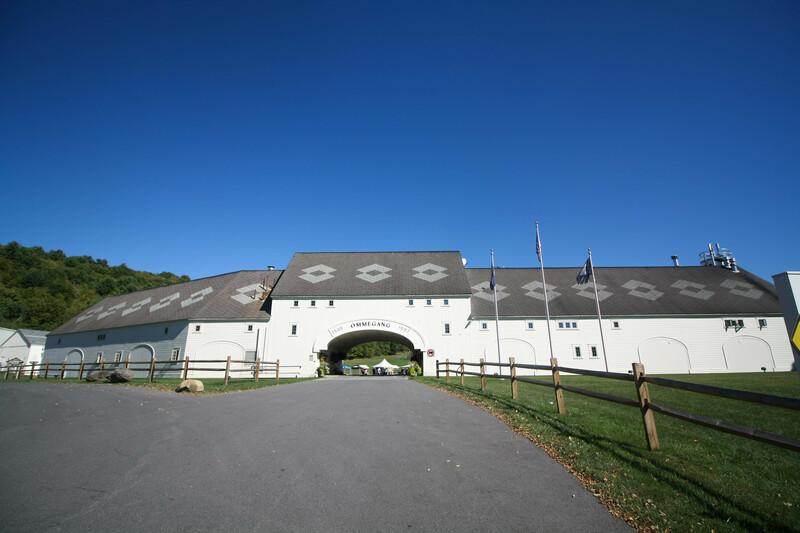 The Ommegang Brewery is located a few miles from the center of Cooperstown in the mountains. We had missed their 19th birthday celebration by one day! 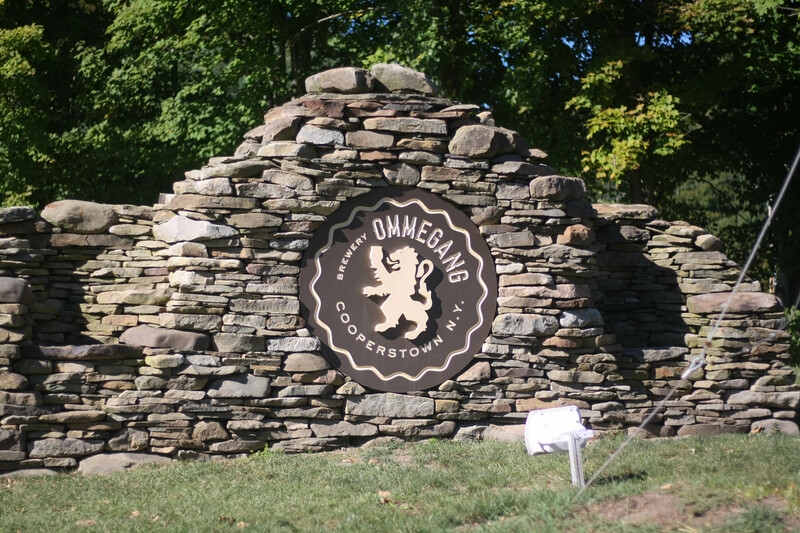 For all of you HBO fans, the Ommegang is the official licensed brewery of Game of Thrones. 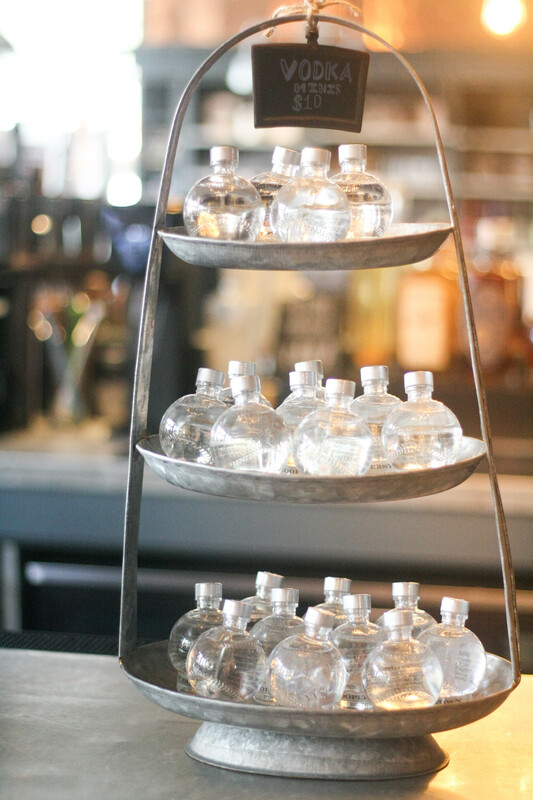 Iron Throne ale, anyone? 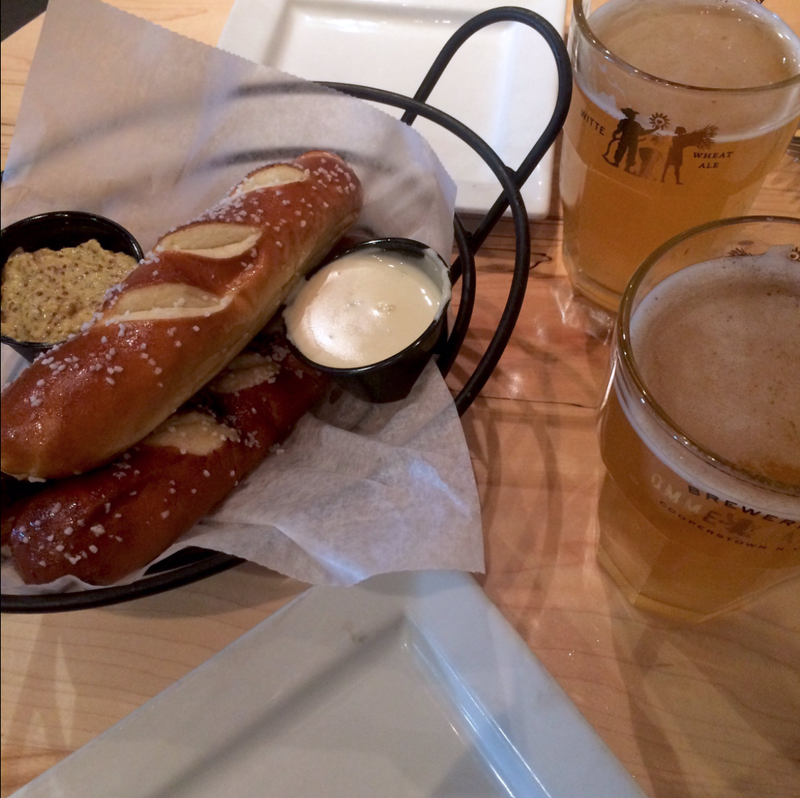 Dad and I ventured out to the brewery for lunch on Sunday and we were floored at how beautiful it was! 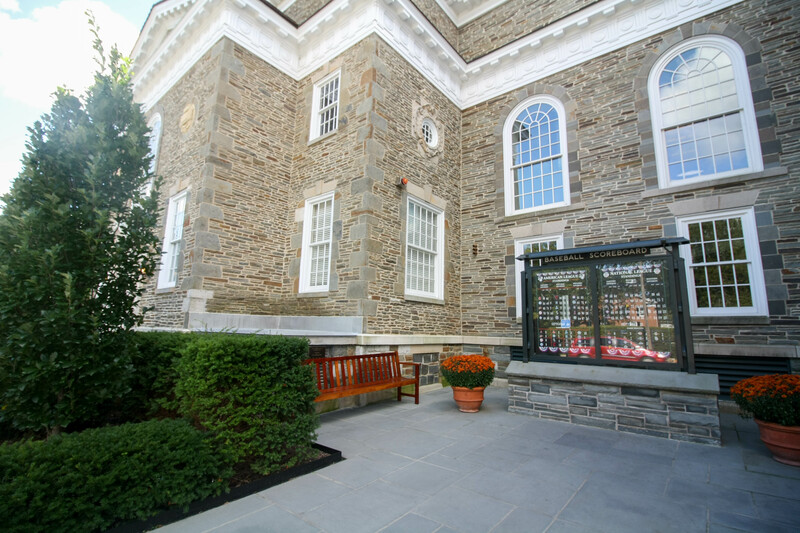 Due to the limited amount of time we had outside of the film festival, we weren’t able to tour the Farmer’s Museum or the Fenimore Art Museum. Both my grandparents (who used to live in New York) and my parents say they are worth the time to tour. 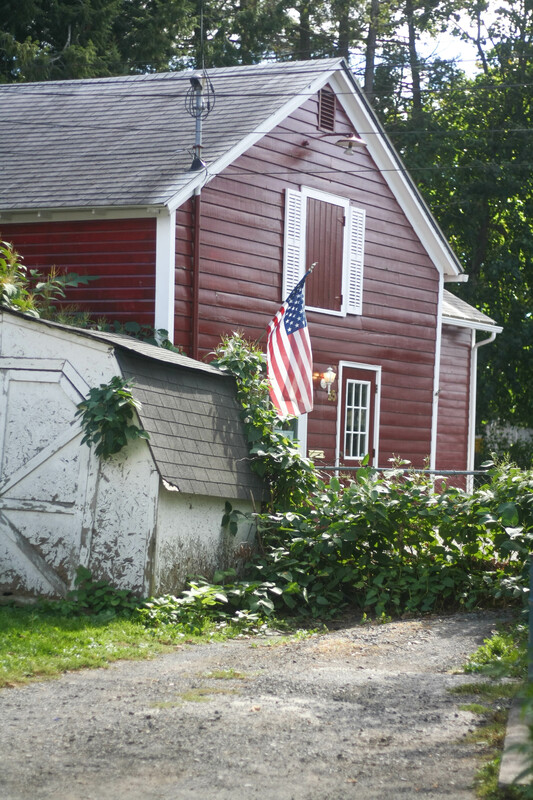 Dad and I made our way to the Farmer’s Museum gift shop and I was able to see the enormity and beauty of the property! 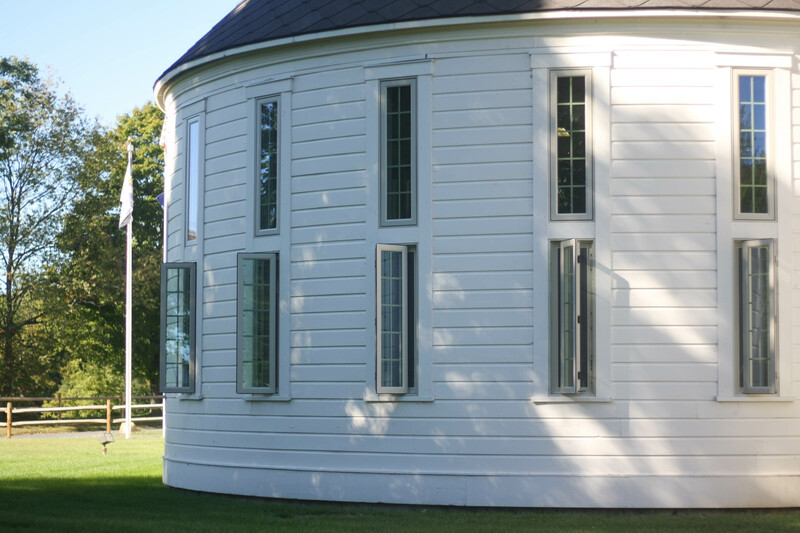 And it even has a gorgeous carousel! 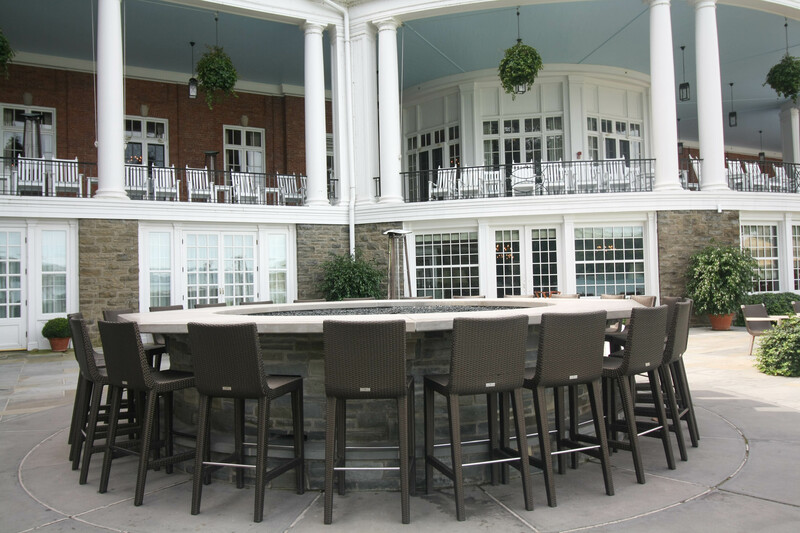 One of the Otesaga Hotel’s best features is the Fire Bar. 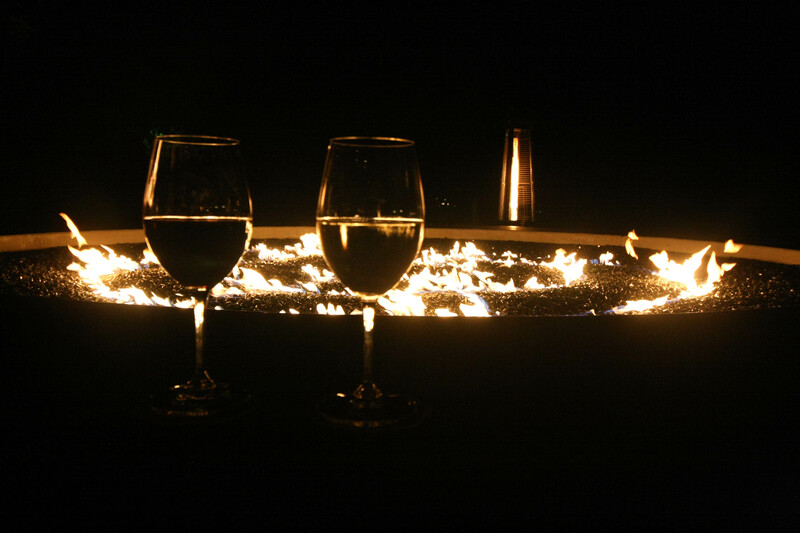 Dad and I visited the Fire Bar for two nights to sip wine and munch on their hors d’oeuvres menu. The evenings were quite chilly (unlike the 90 degree weather Arkansas was simultaneously experiencing) so the warm fire was a perfect pairing with my Riesling. 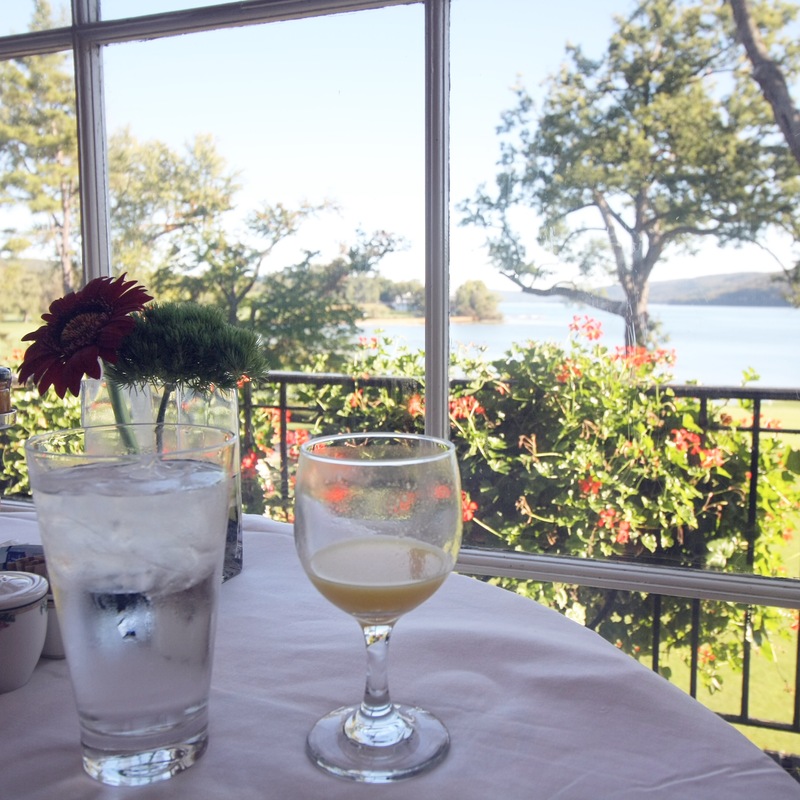 The Glimmerglass Dining Room is the epitome of grandeur. 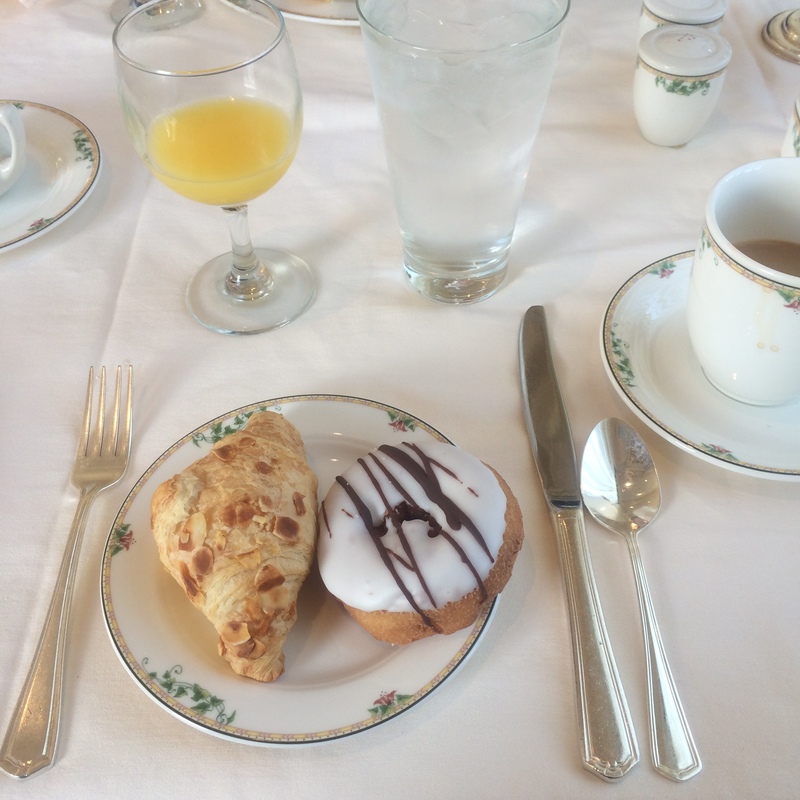 Dad and I enjoyed breakfast in the Glimmerglass dining room twice and each time we were floored by the enormous amount of delicious food being served at several different stations. My favorite was a the custom omelet bar. 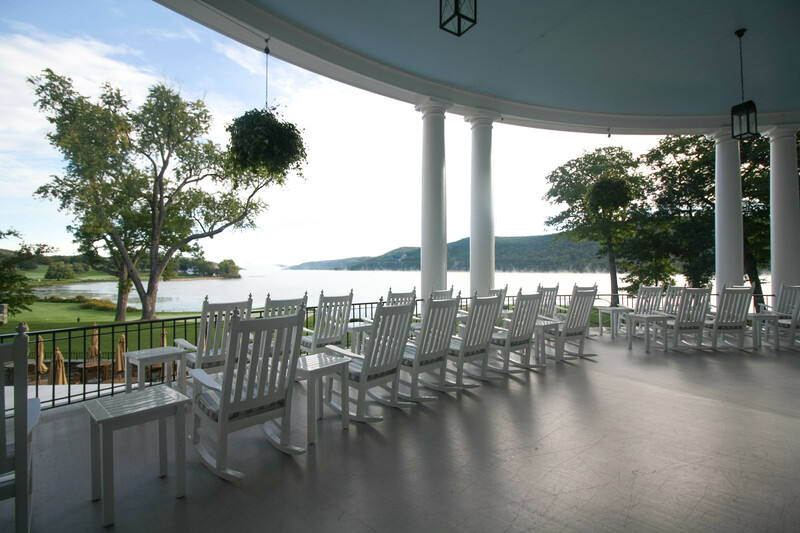 Something to note: parties of two are seated around the perimeter of the room with gorgeous views of Otsego Lake! 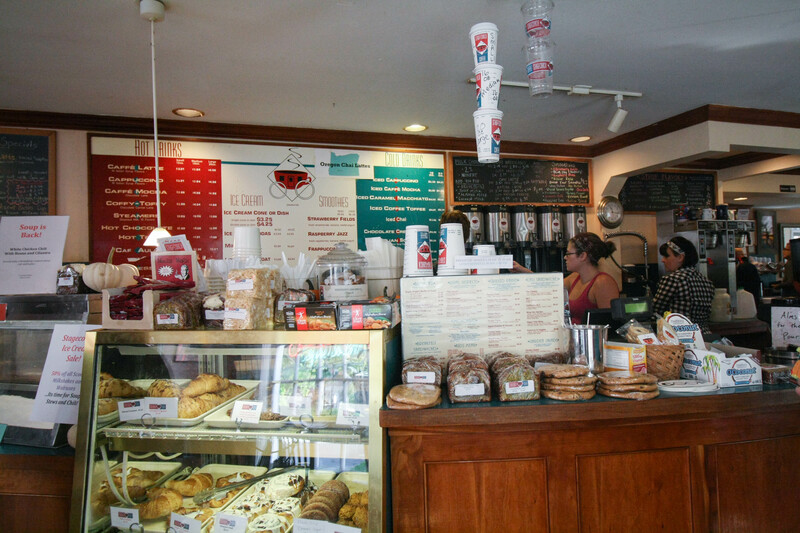 If any of you know me by now, you’ll know that anywhere I go, I need to find coffee. 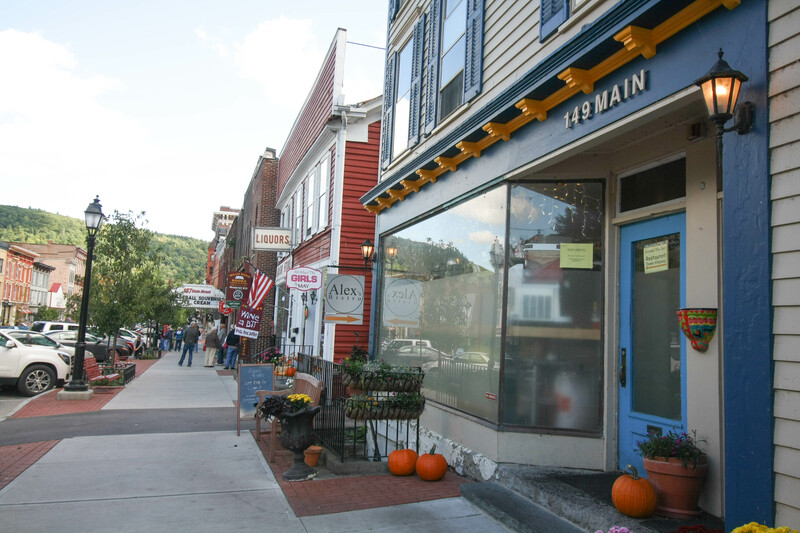 Cooperstown is devoid of any and all chain shops and eateries, so Starbucks was definitely out of the question. I found Stagecoach Coffee via Instagram and knew I had to try it. 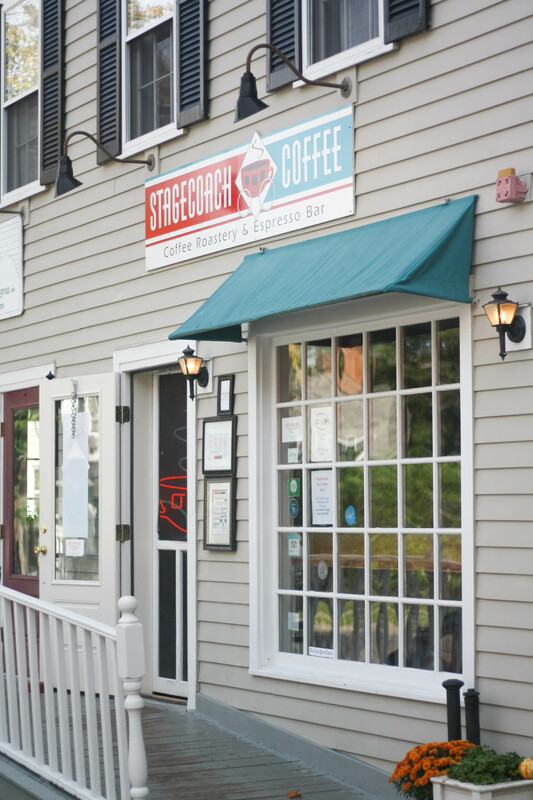 The coffee is strong and delicious and the shop itself is adorable and cozy. Schneider’s was my choice for breakfast when we were running late for the film festival one morning. 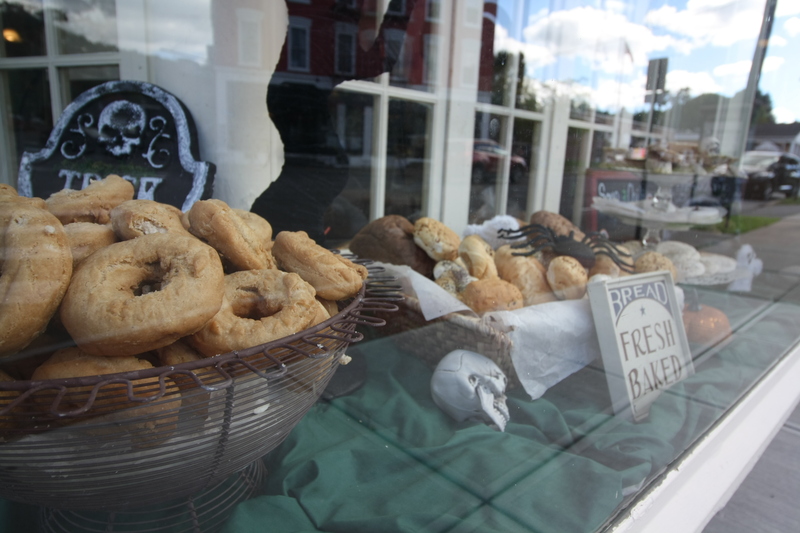 I ran in and grabbed a half dozen peanut butter cookies and was in love at first bite! 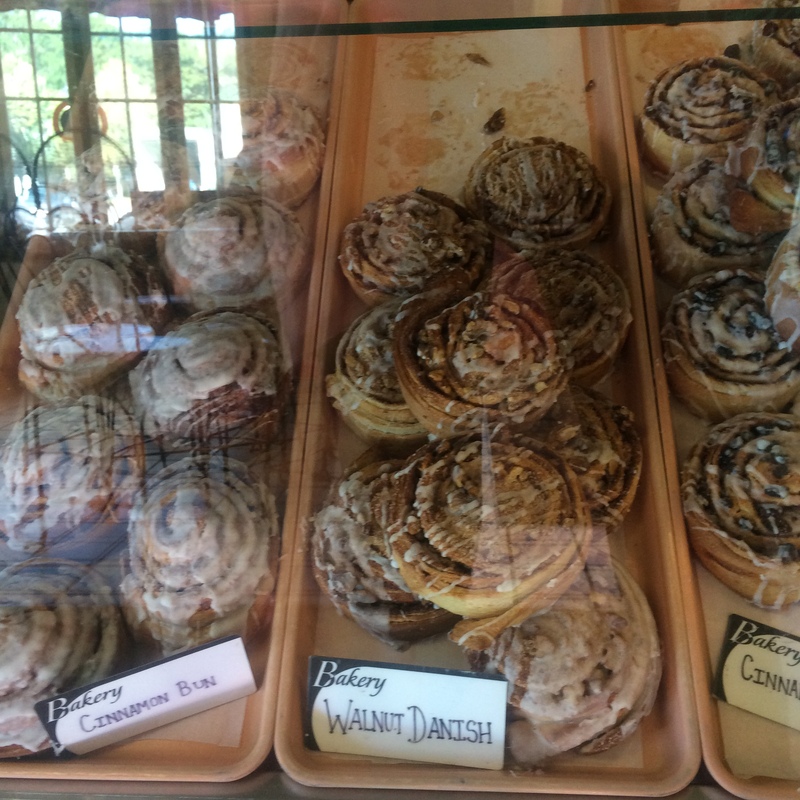 Beware: LOTS of sugar here! 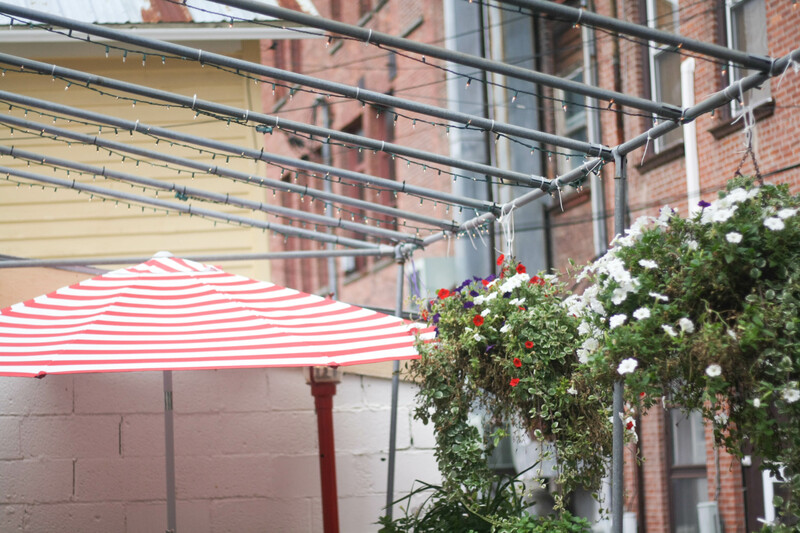 Dad and I stopped by the Pioneer Patio after our first day at the film festival and were pleasantly surprised by this little place tucked away from Main Street. We enjoyed a slice of pizza each on the patio while we jammed to some 70’s rock blasting through the radio speakers. 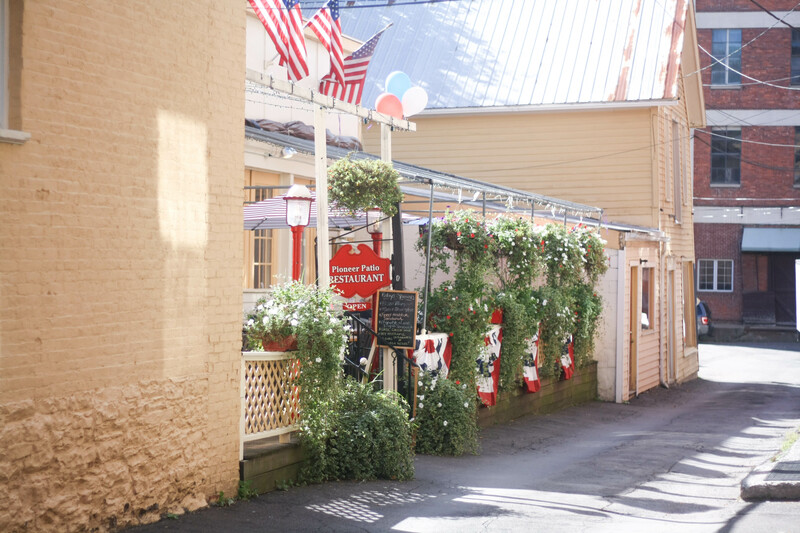 The back alley is quiet and perfectly picturesque. And of course, a girl has to shop. While most of the shops along Main Street are the typical tourist trap type places, these shops caught my eye and didn’t disappoint! 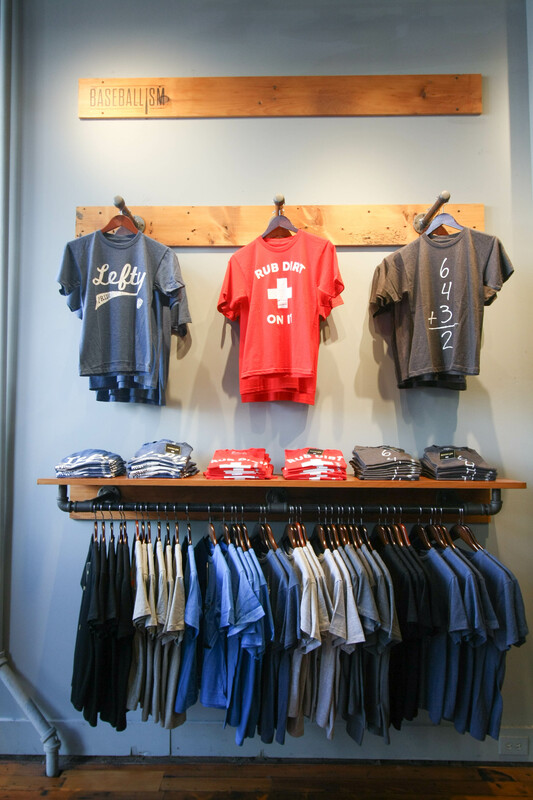 A far cry from most of the shops that screamed “go team!” in various obnoxious ways, Baseballism seemed to be made for the young, hipster baseball fan. All of the t-shirts in the shop featured creative and witty slogans and sayings that only true baseball fans would understand or decipher. My favorite purchase was a t-shirt with a lightening bolt splashed across the front and the world “Wonderboy” printed underneath it. Any guesses what it references? I’ll wait. Of course I have to mention the Baseball Hall of Fame’s own gift shop. While I was pretty disappointed in the small selection of women’s t-shirts and sizes, the men’s section is filled to the brim with souvenir t-shirts and team hats. I finally purchased my Yankees cap from the men’s section. 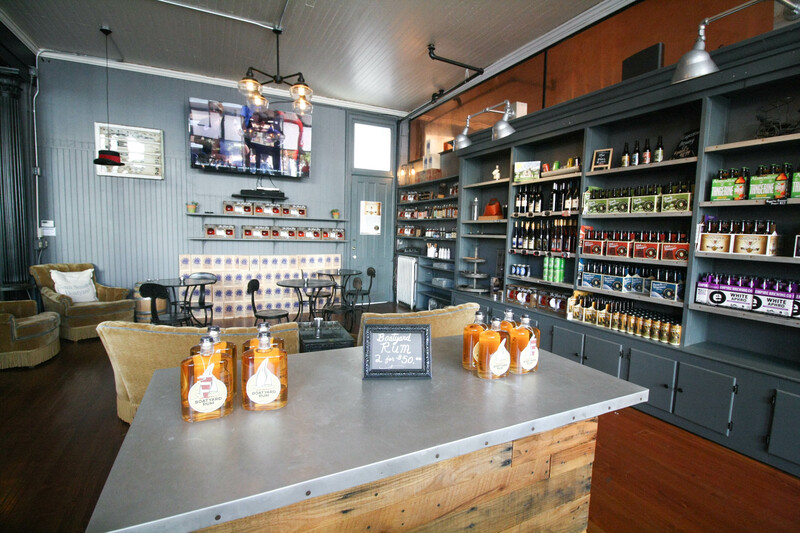 The Beverage Exchange is probably my favorite shop I visited. 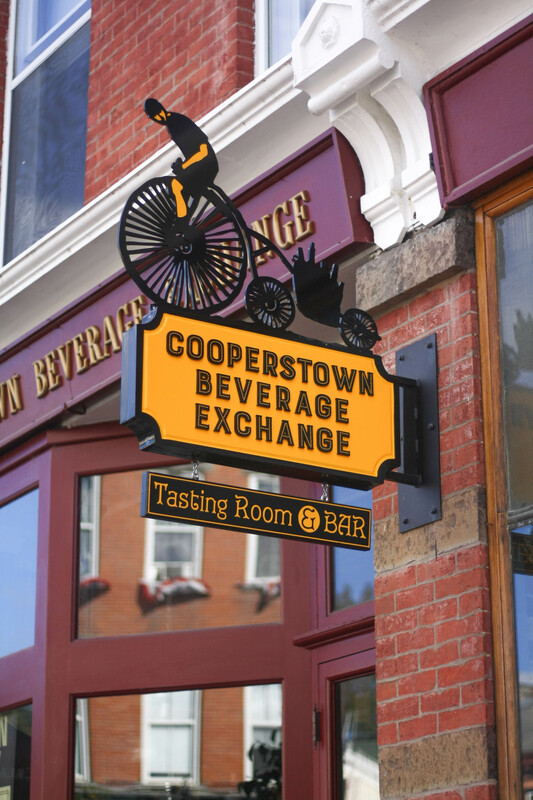 A tasting room by day and bar by night, the Cooperstown Beverage Exchange offers a variety of beers, ales, and liquor that are all made locally. 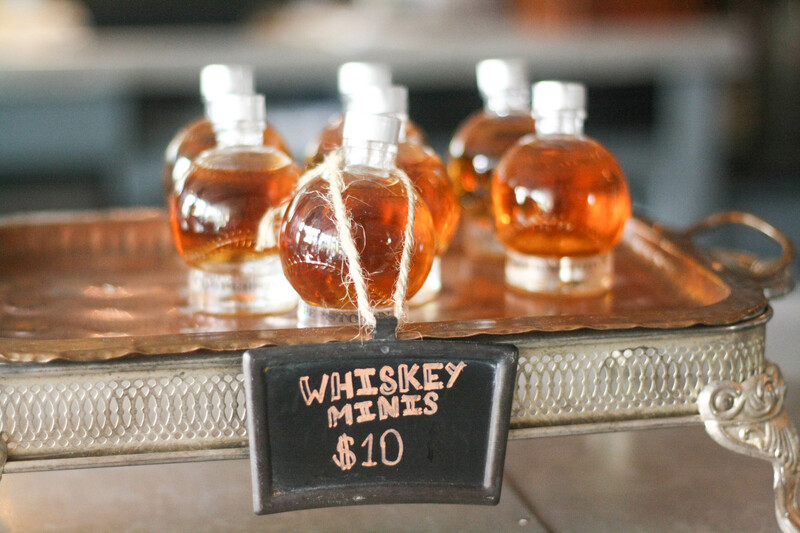 By far my favorite thing in the shop were the decanters shaped like baseballs. I bought a mini Cooperstown Distillery whiskey baseball for Colton and a vodka for me. 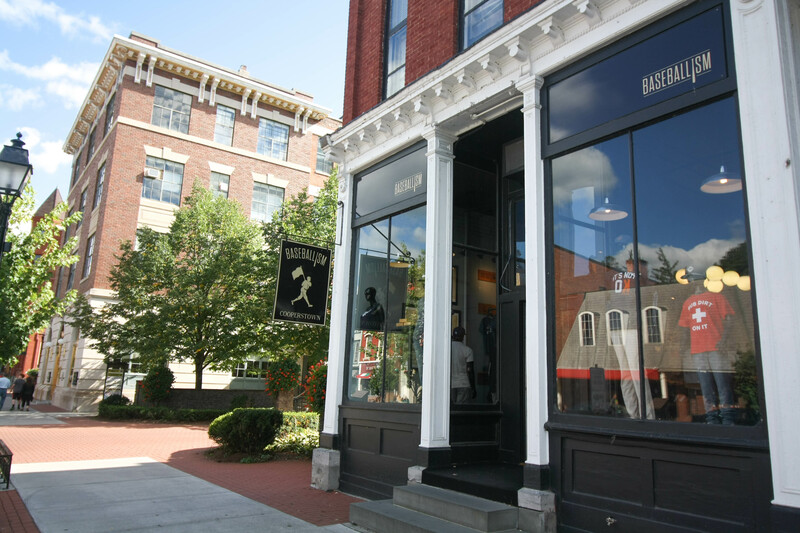 The owner of Paterno Brothers became our friend as we walked up and down Main Street. He sat on a bench directly across from his establishment for a smoke and would talk to us as we walked by each time. I have to say I was a little nervous leaving the land of Southern Hospitality for the land of Crusty New Englanders. 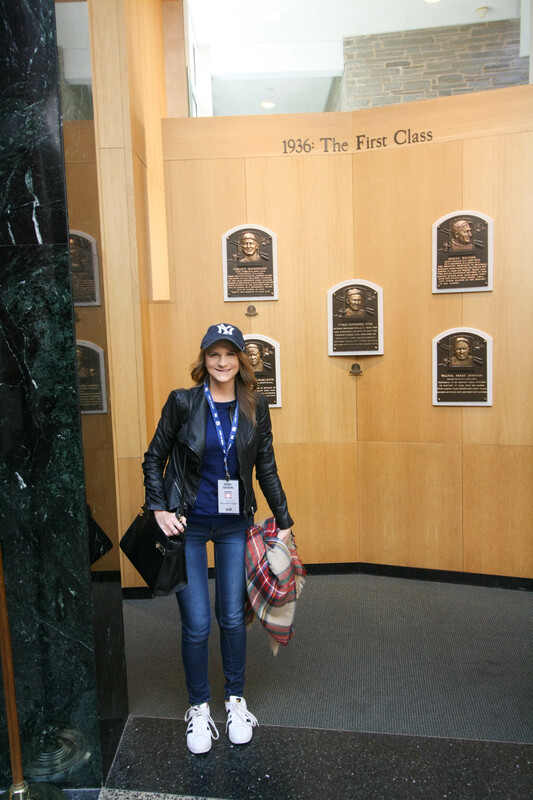 We ran into a few rude New Yorkers, but most of the Hall of Fame employees and shop owners were as nice as could be. 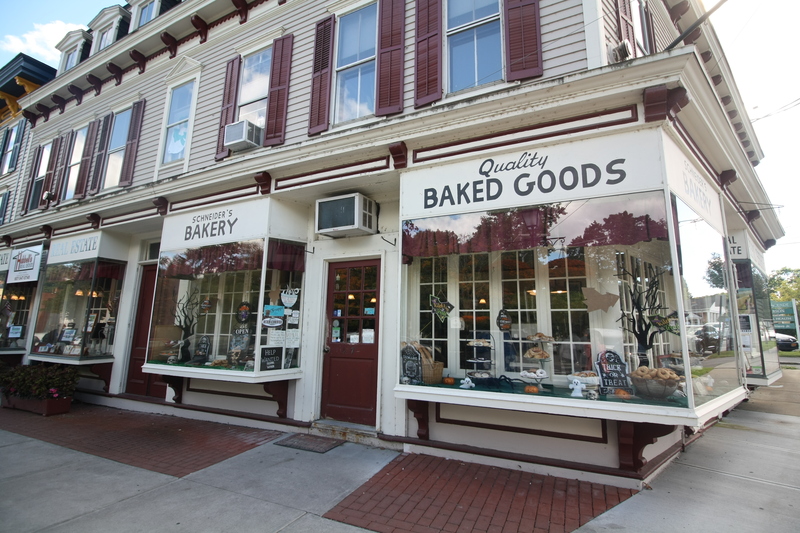 But of all the shops we went into, Mr. Paterno was the friendliest! What a fun looking trip, the town looks so charming!! 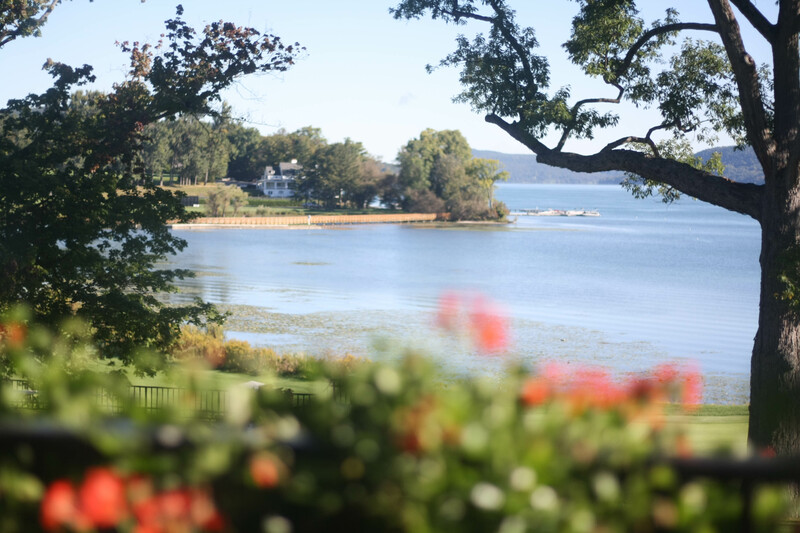 Stunning photos — I’ve always wanted to visit Cooperstown! 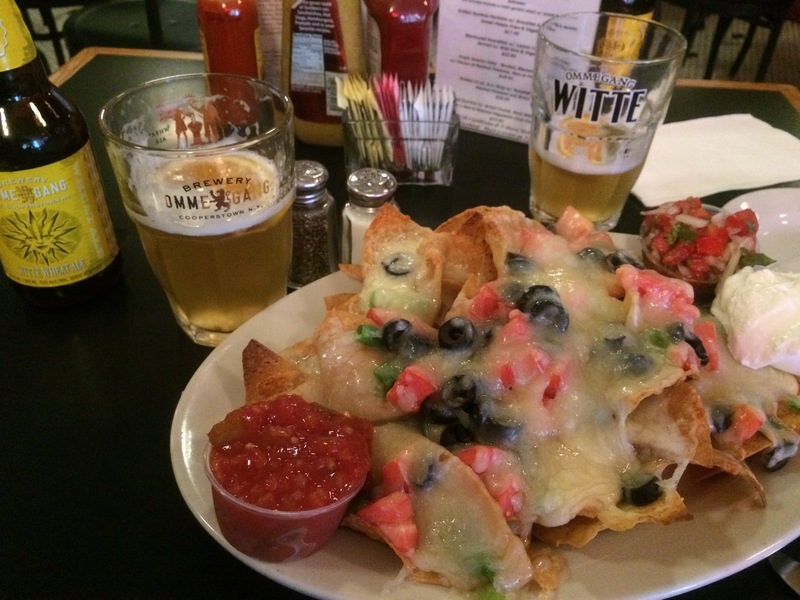 The food looks delicious!! This trip seems so lovely! 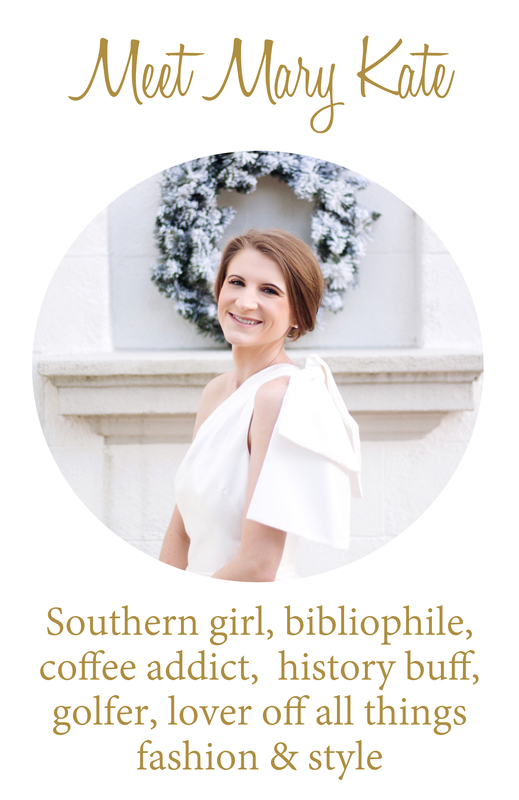 Thanks for sharing love!